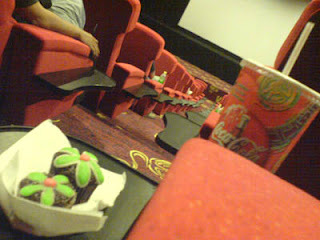 Dida and I went to the new GSC Signature in The Gardens last night to catch National Treasure, The Book of Secrets. The movie was good -- as most would expect it to be, but my entry this morning is going to be about the cinema. I thought it was very interesting. A little posh, if I might add. The seats were in rows of two so in a way, it was kind of private. Might not be ideal if you're watching alone or with two other friends, so here's a tip if you've never been to: Go in a round-number of people so no one would have to sit alone. With RM18 a pop (or RM20 if it's a new movie; as I had reasoned why I had to pay that extra 2 Ringgit) you'll get a comfortable seat with a little table at the side -- really handy! hahhaha! You could also put up the hand rest so you could snuggle with your partner -- if that's your kind of thing. Since we were watching National Treasure, I find it unnecessary to do so as I didn't need to hide behind my sister's arm as I would have if we were watching a thriller. heh! Another thing that I like about the cinema, they have plenty of plush chairs around the waiting area. So instead of standing around or walking aimlessly around the mall until the show time, you could easily take a seat and chat with your friends. The snacks area is a little obscured though, so you will have to look around a corner to realize that it's even there! And the prices were a little higher than the rest of the cinemas. One other plus point, I like to believe that rempits won't be around this place too much due to the price. So if you have the extra money JUST to avoid them, this place would be perfect for you! As for me, although I can't stand rempits.. I couldn't stand the thought of spending an extra 8 Ringgit just to avoid them even more. I think I'll catch the next movie I want to see at the building next door, thanks! A little football news: Man United was matched up against Lyon in the first Champions League knockout round. Arsenal against AC Milan which had made me laugh out loud when their names were pulled out from the draw pot as Liverpool was matched up with Inter Milan. We'll see how that goes in February! A hectic week for the English football in the coming week! Can't wait!